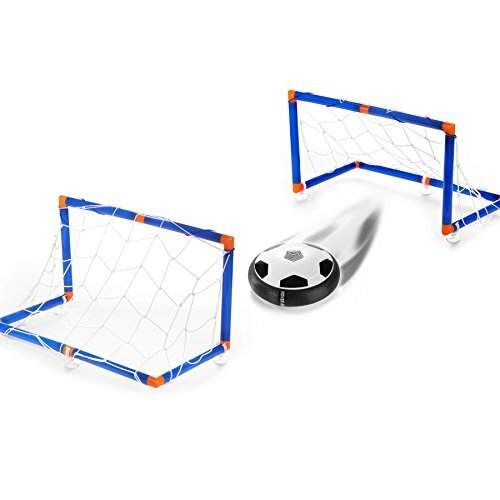 HOVER SOCCER BALL - Our ball toy is hover designed. Pneumatic suspension technology adopted, the hover soccer can float on a cushion of air produced by a powerful fan and built-in rotary motor, which makes this girl and boy toy easy to glide over any smooth surface. KIDS SIZE AND LED LIGHTS - This kid toy is equipped with colorful LED lights Which makes it possible to have fun even at night and bring more fun to games. Standard size is 7.1 inch, neither too big nor too small. The best choice for kids Birthday gift or Christmas gift. SAFE MATERIAL AND GOOD PROTECTION - This kid toy is made of Non-toxic plastics, with foam bumpers and soft cushion of foam surrounding the edge of the disc, which makes the boy toy safe enough for small kids or pets to play with. EAST TO USE - Easy to install the portable goal. Put your ball on a smooth surface and give it a little kick! The frame of such soccer is in foam packaging, so the ball can rebound when touching objects. Requires 4 * AA batteries (NOT INCLUDED).